It’s often hard to find a tire that is good at everything, typically you have to make some sacrifices. However, I found the Goodyear Duratracs to be some of the best options on the market. Duratracs clung to the grippy slick rock of Moab. 1. Off-road capability. The Duratracs were absolutely amazing on both the slickrock of Moab and the granite slabs of the Rubicon. I rarely had any issues on rocks when properly aired down. The wider footprint at 12psi provided ample sidewall flex and I never lost a bead. The tires held up amazingly well with offroad abuse, and I never saw a puncture or any other off road related problems. 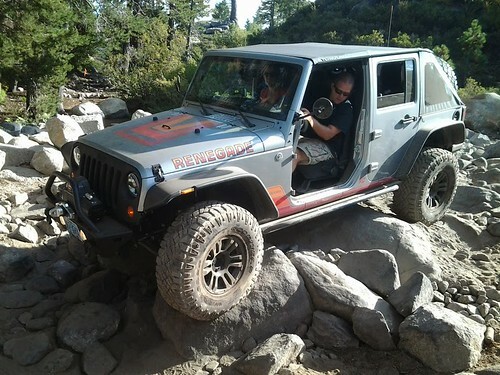 The tires worked well on the Rubicon Trail. But remember that whole sacrifice part? Yeah…the DTs are NOT good in the old Oregon’ mud. This is their shortfall, but it is expected in a non-M/T (Mud Terrain)tire. They still worked out, but I was often stuck in spots my where my friends in M/Ts had no problems. 2. Snow. Let’s face it, if you live where it snows you want a good tire. The Duratracs took me up Mount Hood to countless ski days in all types of precipitation and not once did I feel they were not performing. From unplowed parking lots to hard, icy packed snow, the DTs did a great job. DTs in the snow are amazing. 3. On-road handling and noise: The Duratracs handled like an A/T (All-Terrain) tire should when on the road. Almost silent, they were very well-behaved and when the pavement turned wet, I felt certain of my Jeep’s stability and braking. 4. Price: I always get my tires from Discount Tire and the Duratracs were right in my budget. I decided on the largest tire in the line, the equivalent of a 35x1250r16. The tires aged evenly and lasted a SURPRISINGLY long time, given the amount of both off road and highway driving I do. 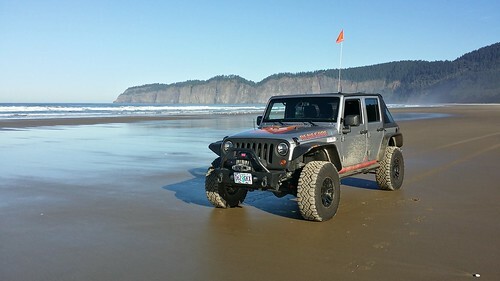 Even in the sand of Sand Lake, these tires were awesome. Bottom line: Sadly, I recently sold my old DTs, as I upgraded to a 37″ tire. If Goodyear made these in a 37, I would have five of them on my Jeep right now. But, such is life and I will soon review the Nitto Trail Grapplers which I replaced the Duratracs with. These are a FANTASTIC tire! Glad to see this real-world, lifetime test! Really leaning hard toward the Duratracs. I just wish GY made these in a true 35! 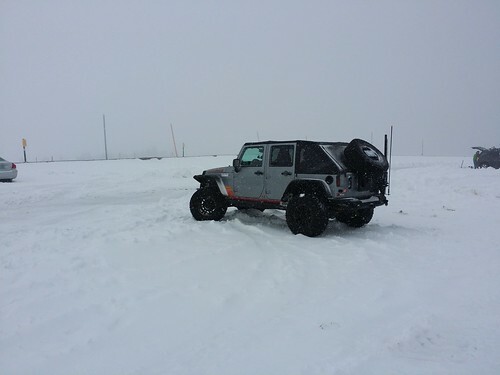 I recently installed a brand new set of them on one of my XJs (nothing huge, 31×10.50 for a 3.5″ lift), since they meet the local winter tire requirement (“snow peak” rated). I’m ecstatic, on road/highway, as well as in deeper snow or thicker ice when I go to my mountain cabin. The fact that they look gorgeous wasn’t a factor in my choosing those, but it doesn’t hurt. 🙂 Alternative would have been BFGoodrich All-Terrain T/A KO2, which I had on other trucks, and are also excellent all season. Happy to hear you and I are on the same page! And yes, these tires look damn good on our rigs to boot. Thanks for stopping by! Thanks to Internet, I learnt that many tyre options are not really Vegan! Most tyre manufacturers use stearic acid in tyre manufacturing process. Stearic acid can come from plant extracts or animal extracts. Are Goodyear Duratrac tyres vegan?